Fragoso Advogados is a traditional Criminal Law Firm, which practice involves mainly the areas of Financial Crimes, in cases of major national repercussion, and the Insurance segment. It was founded in 1952 by the jurist Heleno Cláudio Fragoso, one of the most prominent criminal lawyers in the country, vice president of the Federal Council of the OAB (the Brazilian Bar Association), and defense counsel of political prisoners during the military regime. Aligning tradition with modernity, Fragoso Advogados follows the evolution of Criminal Law, and, more recently, has been working on the repatriation of overseas funds and cybercrimes. Other fields of expertise of the law firm are financial market crimes; crimes against businesses; frauds suffered by insurance companies; money laundering; crimes against the tax order and the consumer; social security crimes, and patent and trademark infringements. Fragoso Advogados also works in the area of ​​Criminal Compliance. In addition to the experience of Fernando Fragoso, Christiano Fragoso and Rodrigo Falk Fragoso, the firm has a team of 16 talented criminal lawyers. Fernando Fragoso has been working as a Full Professor of Criminal Law at Candido Mendes University, since 1981. He also teaches at the Economic Criminal Law Graduate Program at FGV (Rio de Janeiro and São Paulo) and holds a Master’s Degree in Public Law from the Federal University of Rio de Janeiro (UFRJ). He was twice president of the Institute of Brazilian Lawyers (Instituto dos Advogados Brasileiros) (2010-2012 and 2012-2014), where he chaired the permanent commission of Criminal Law from 2008 to 2010. He was the vice president and served as Secretary General and Member of the Council of the OAB/RJ (the Brazilian Bar Association – Rio de Janeiro Chapter). Author of several legal articles, he has been a criminal lawyer since 1973, when he graduated from Guanabara State University (currently Rio de Janeiro State University – UERJ). Christiano Fragoso is responsible for the office of Fragoso Advogados in São Paulo. He holds a Ph.D. in Criminal Law from UERJ and a Master’s Degree in Criminal Sciences from Candido Mendes University. He is an adjunct professor at the Law School of Rio de Janeiro State University (UERJ), and also has a specialization in European and Economic Criminal Law (University of Coimbra / IBCCrim). Christiano is the author and co-author of three books (“Repressão Penal da Greve”, “Autoritarismo e Sistema Penal” and “Reflexões criminológicas e dogmáticas acerca do crime de desobediência”). Rodrigo Falk Fragoso is a professor of Criminal Law at the Graduate Program of PUC-Rio. He currently writes the column Financial Crimes at InfoMoney. A criminal lawyer since 2000, he works in cases of financial crimes of major national repercussion and in favor of banks and insurance companies that have suffered economic frauds. With a Master’s Degree in Criminal Sciences (Candido Mendes University), with the dissertation “Agente Provocador” (2006), he has a specialization in European and Economic Criminal Law (University of Coimbra / IBCCrim) and the course “Leadership in Law Firms” (Harvard Law School). He was a professor of the Graduate Program in Criminal Law, Criminal Procedure and Criminology at Candido Mendes University (2010) and of Economic Criminal Law at the Law School of FGV-Rio (2008-2009). 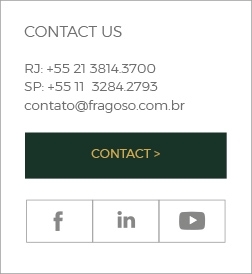 Fragoso Advogados is headquartered in Rio de Janeiro (Rua da Ajuda, 35/25th Floor) and has a branch in São Paulo (Av. Paulista, 2202/13th floor, Suite 136, Bela Vista). It works in permanent association with criminal law firms in other states and abroad, in the significant performance of services outside Rio de Janeiro and São Paulo.